Protect your baby from sunburn with STYLE! Tie on to any stroller these gorgeous, 50+UPF summer weight blankets do it all! When you're heading out for a day of fun in the sun with your little one, you want the day to be full of fresh air and sunshine, but you don't want harsh ultraviolet rays to affect your baby's delicate skin. Our UV cover can help you take your stroll while keeping Baby safe from the sun. The stylish cover fits over top of a wide variety of stroller styles and can be used to cover car seats as well. Once in place, the cover provides 50+ UPF protection, blocking ultraviolet from reaching your child's skin. Designed for easy traveling, the UV cover rolls up and can easily fit into the basket of your stroller or inside of your diaper bag. Despite its effective sun protection, the cover is light in weight and allows air circulation, so your child will remain cool throughout your outing. 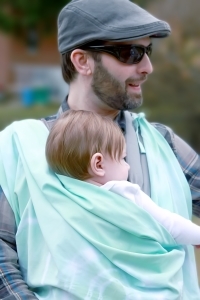 The cover can even double as a picnic blanket or a play surface for Baby when you're at the park or the beach.